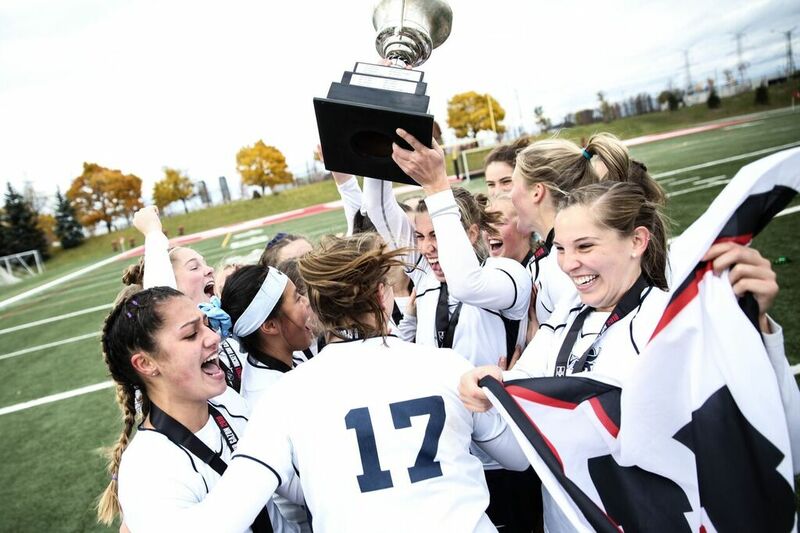 The Victoria Vikes topped the host York Lions by a score of 3-1 in Game 2 of the U SPORTS Field Hockey Championships on Saturday afternoon to bring home the program’s first national banner since 2008. The game was intense from the beginning as both teams seemed desperate to get off to a good start. The Lions had the first scoring chance after U SPORTS All-Canadian Jaslan Stirling broke in front of the Vikes net and was fouled inside the circle. An ensuing penalty corner was defended well by the Vikes defence though, as they shut down the Lions attack and cleared the ball quickly away from goalie Robin Fleming’s net. The Vikes went on the offensive for the next several minutes, as they kept the Lions pinned deep in their own end for the better part of the next 10 minutes. The Lions defenders held strong though, with fifth-year veteran Sara Vollmerhausen making a number of excellent defensive plays to keep the game scoreless. Victoria opened the scoring at 13:18 of the first half after a scramble following a penalty corner in the Lions end. Midfielder Lindsay Cole corralled a loose ball and dove with a swipe of her stick to score the game’s first goal past Lions goalkeeper Alycia Gray. They extended their lead to 2-0 just over a minute later on a goal by fellow midfielder Stefanie Sajko, who was stopped on her first attempt but tapped in a rebound to put the Vikes in front by two. The home team established some pressure late in the first half but were unable to capitalize as the Vikes took a 2-0 lead into the locker room at halftime. After some sustained pressure in the Lions end to begin the second half, Victoria made it 3-0 on a goal by rookie Cara Butler. The Vikes were buzzing around Gray with a number of chances before Butler found the back of net. The remainder of the second half was played mostly in the middle of the field until Lions defender Sydney McFaul added a late goal for the host team with less than a minute left but it was not enough as the Vikes prevailed 3-1. UVic outshot York 11-5 in the final contest of the season for both teams and dictated the field position for the majority of the game. The victory for the Vikes was their 12th U SPORTS championship in program history and marks the eighth year in a row the trophy has been won by a team from the Canada West conference. The UBC Thunderbirds had won seven nationals titles in a row before this season. The Lions fall in the national final for the second year in a row but the future looks bright for the back-to-back OUA champions, with only two graduating players and a young roster on the upswing, the team looks to be contenders for the national title for several years to come. The Vikes’ Emily Wong was named tournament MVP as well as Player of the Game in the championship win. McFaul was named Player of the Game for the Lions, while her teammate Sara Vollmerhausen was awarded the R.W. Pugh Fair Play Award.